As we know Mary Mary's Tina and her husband Teddy went through a major ordeal earlier this year. The CHEATING of course, is what I am talking about, but it looks like things are good for the married couple. 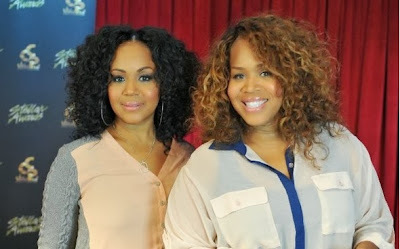 I was very shocked to hear Mary Mary will be continuing season 3 of their reality show on WETV Mary Mary. My surprise shockery came when Tina Campbell told us back in June after the interview with Ebony Magazine that her husband Teddy cheated on her. Speaking from the flesh side of things, if I was in her in shoes I would not want to re-live or explain myself to the world about what went on in my marriage. I personally feel season 3 will most likely be centered around Tina and her husband and the cheating. And that's not what I love Mary Mary for. I love them, because of their art of music, their Christian beliefs, and the their love for God. And if the show is centered around the drama of Tina and Teddy's marriage in a negative way, it would be a real turn off for me. But speaking from the Godly side of things, all I can do is support both of the sisters. I know it's a challenge to deal with something like this out in the open, but I support and pray for them both. And I think we all should. I always tell my son not to judge people, because he doesn't have a heaven or hell to put anyone in and I believe the same saying holds true in Tina Campbell's life. However, I can't wait for the previews to start showing so we can begin to see what we can expect from season 3 of the mary's. The new season of Mary Mary is schedule to air February 27, 2014 on WETV. We're so excited about the next season as we enter a new phase in our lives and careers. This past year has been both overwhelming and exciting and we are happy to share those moments with our fans. We are grateful to provide viewers with an honest look into who we are and how we handle our differences, and we hope to continue to inspire and encourage. I will say this... we are not breaking up, but we are taking a break. I'm going to do some solo music. Tina's going to vacation and travel the world. We've been joined at the hip the last 12 years and I think in order for us both to be our healthiest selves, just as women, in the group, we will take some time to think and re-assess. We've been going constantly year after year, baby after baby, tour after tour, and now season after season on TV. Their schedules have become so overwhelming and busy that the two can't seem to find time to work together anymore. Erica also said that during their hiatus, it's going to serve as time to reconnect with God. Speaking of solo career? Erica Campbell's Just A Little More Jesus was her first solo single and seems to be doing okay. Did Mary Mary's Tina Campbell's Husband Really Cheat on Her...YES! Huffingtonpost - Mary Mary says, Our families aren't the reason we may take a break. We always knew that we wanted work and have kids, Tina said. We never looked at the kids or our husbands as a reason to not be a group. That's not the motivation for either of us. It is 12 years and time to re-assess, re-evaluate, take a moment, breathe, inhale, exhale, and all of that. Da Gospel Truth says I'm excited for these ladies getting a chance to switch it up a bit and do some things they'd like to enjoy!